This city landmark should be the first place on any visitor’s itinerary. It is a huge compound on Na Phra Lan Road near Pramane Ground which is surrounded by high white walls and occupies an area of about a square mile. The palace, begun in 1782, consists of several buildings; with highly decorated architectural details. The Royal chapel, Wat Phra Kaeo, which is in the same compound, houses the Emerald Buddha, the most sacred Buddha image in Thailand. Photography inside the building housing the Emerald Buddha is forbidden. The complex is open daily from 8.30 a.m.- 3.30 p.m. 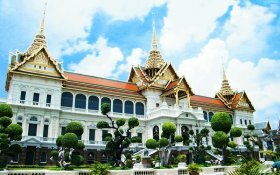 Admission fee is 350 baht (including tickets to The Coin Pavillion & Phra Thi Nanl Vimanmek & Abhisek Dusit Throne Hall). Proper dress is essential. From the hotel, you may take the bus No. 1 or 25 or 53 at front of the hotel to reach there within 10 minutes only. 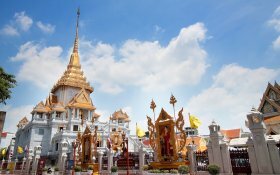 At the end of Yaowaraj Road, near Bangkok’s Hualamphong Railway Station, is a temple situated on Traimit Road. This temple is known for its famous Golden Buddha, constructed during the Sukhothai period. The image, of solid gold, is three meters high and weighs five and a half tons. The building holding this image is open to the public everyday from 9.00 a.m.- 5.00 p.m.
Sampheng is well known in present is the Economic Road in the past. It has been found in the reign of King Ram 1. 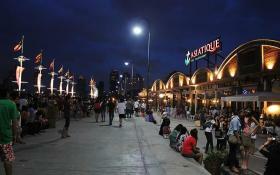 It now is one of the largest retail & wholesale market in Bangkok. Even the area of this market is not too large; however, there are many varieties of products, such as, earrings, gift and frame of photo, album, towel, toy, Kitchener and etc. As this location is quite close to the hotel, so that you can reach there by walking within 5 minutes only, it’s open from 08.30 to 18.00 hours. 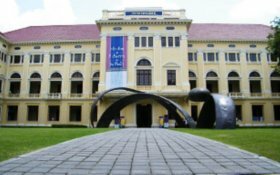 “Museum Siam” is the Innovation Museum in Bangkok that provides the new technology for education, e-learning and enjoying of historical. It is also very useful for the children and people who want to upgrade standardize their education and e-learning, more over to have self confidence, especially, to open them to world. From the hotel, you may take the bus No. 53 at front of the hotel to reach there within 10 minutes only. This world famous temple is located right next to the Grand Palace, on the south side. 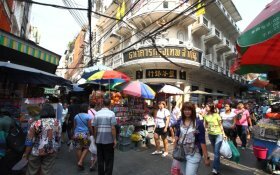 It is one of Bangkok’s oldest and largest temples. 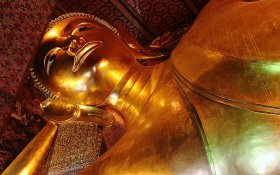 Wat Pho was built by King Rama I nearly 200 years ago and houses the gigantic gold-plated Reclining Buddha. This unique image is 46 metres in length and 15 metres high with beautifully inlaid mother-of soles. Wat Pho is also regarded as the first centre of public education and is sometimes called “Thailand’s First University”. The building housing the Reclining Buddha is open daily from 8.00 a.m.- 5.00 p.m. The new travel destination and lifestyle shopping project, located on Chareonkrung Road by the Chaopraya River, will be the latest Bangkok’s new landmark. From the hotel, you may take the bus No. 1 at Charoenkring road to reach there within 20 minutes only.